I am always switching up my skincare based on how my skin is looking/feeling every couple of weeks. This pregnancy has taken a toll on my skin. It changes all the time. One day my skin would look flawless(or as near to flawless as you can get) and the next day it would be a whole different story. It's so annoying. 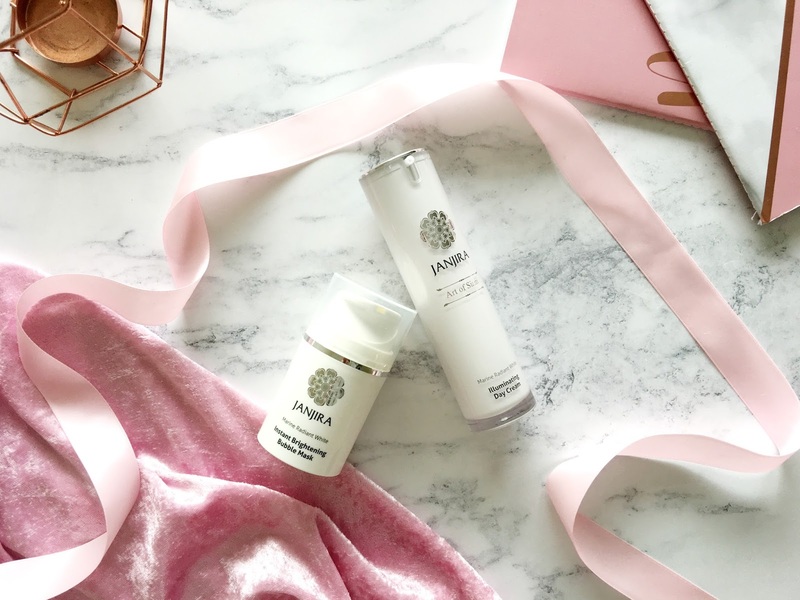 When my skin is looking tired and dull I like to remedy that with two products from Janjira, the Illuminating Day Cream and Instant Brightening Bubble Mask from their Marine Radiant White skincare range. The Illuminating Day Cream(£24) is formulated to prevent the signs of ageing using a combination of three key ingredients: Algowhite(which has proven skin brightening attributes), Vitamin C(protects the skin from free-radicals, increases collagen and reduces the appearance of skin discolouration etc) and Vitamin B3(minimizes dark spots, retains skin moisture and reduces inflammation). It includes a pump which makes distribution of the cream super easy, and it's much more hygienic too. The cream is quite thin, though not too thin that it's runny which I like. In fact, it feels quite lightweight, and it absorbs so quickly too, which makes it perfect to apply before makeup. It is the perfect base. It makes my skin feel so smooth, soft and hydrated. I can easily see the difference in the condition of my skin before and after using it. It looks visibly more radiant and healthy. It almost looks as if I am glowing from within. You know that 'pregnancy glow' that is supposed to be anything but a myth? Well it's non existent(for me at least). This Day Cream is the ultimate pick me up. I can fake it until I make it with a little help from this. The other product that helps towards brightening my complexion is the Instant Brightening Bubble Mask(£24). I have tried many different masks over the years, but this, well this is entirely different. It includes the same concoction of ingredients like the Illuminating Day Cream, and it also has a pump mechanism too. It is said to eliminate the skin of any toxins, while also giving your skin that illuminated effect and reducing the appearance of dark spots. When dispensing the mask it comes out in liquid form, though when you leave it to do it's thing, it oxygenates, causing that bubbling effect. It feels very strange at first. It makes my skin feel a little tingly, though it's not too uncomfortable. I was instructed to use at least 2-3 pumps of the product and leave it on for a short period of time before rinsing(3-4 minutes to be precise). I found that this was the right amount of time to leave it on for. The results are instant as the name of the mask says. I look so much more awake and my complexion looks a hell of a lot more luminous too, though I can't tell the difference in the texture of my skin until come morning(I like to use it before bedtime). When I wake up in the morning, any spots I had beforehand are somewhat reduced and the redness is less prominent too. Both products are incredible. They take my skin from zero to hero(as cringe and weird as that sounds). If you want a little pep in your step, or something to perk your skin up then this duo is the way to go. You can find both of these fabulous products stocked here if you're interested to try them out yourself. Have you tried anything from Janjira?